Peachtree Publishing Company, 9781561454259, 1pp. Martina the beautiful cockroach doesn't know coffee beans about love and marriage. That's where her Cuban family comes in. While some of the Cucarachas offer her gifts to make her more attractive, only Abuela, her grandmother, gives her something really useful: un consejo incre ble, some shocking advice. 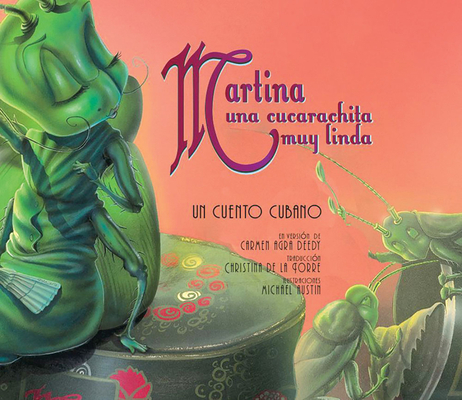 At first, Martina is skeptical of her Abuela's unorthodox suggestion, but when suitor after suitor fails the Coffee Test, she wonders if a little green cockroach can ever find true love. Soon, only the gardener P rez, a tiny brown mouse, is left. But what will happen when Martina offers him caf cubano? After reading this sweet and witty retelling of the Cuban folktale, readers will never look at a cockroach the same way again. Also in Spanish and audio, Carmen Agra Deedy delivers a deliciously inventive Cuban version of the beloved Martina folktale, complete with a dash of caf cubano.